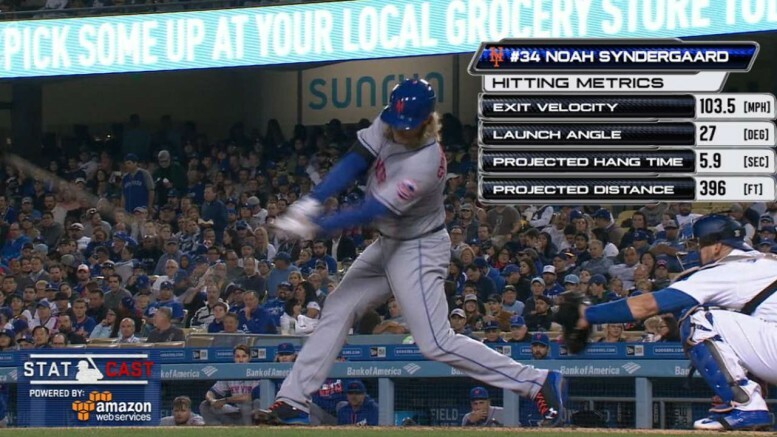 The Mets' Noah Syndergaard last night became the first pitcher in nine years to homer twice in the same game. Noah Syndergaard got the win with his arm, but really it was his bat that did the talking in the Mets’ 4-3 win over the Dodgers. “Thor” went deep not once, but twice, accounting for all four runs. Syndergaard is the first pitcher since Micah Owings in 2007 to accomplish the feat, and his two jacks simply added to the barrage the Mets have experienced this year. The homers gave the Mets sole possession of the Major League lead with 51. History was made in DC, with Max Scherzer fanning 20 against his former club. He outdueled another ace facing his old mates in Jordan Zimmermann, and joined Kerry Wood, Roger Clemens (twice), and Randy Johnson as the only pitchers to strike out 20 in a game. It was a reminder that despite a somewhat up-and-down year, Scherzer is still as dominant as any starter in the game today. What is going on between the Reds and Pirates? I’d apply that question more to the Reds’ relative success over the last couple years against Pittsburgh, but of course point to the bad blood brewing between the NL Central rivals. Six batters were hit yesterday, and three people were ejected, including Cincinnati manager Brian Price. The Reds are going nowhere, but they find a way to get under the skin of the Pirates. I would say this conjures up memories of the Cardinals-Reds war circa 2010, but the difference then was that both teams were actually in contention. Three games ended in walkoff fashion yesterday, including two on home runs. Marwin Gonzalez ended a 16-inning marathon for the Astros against the Indians, while Chris Iannetta sent the Mariners home winners against the Rays. But it was a much more demoralizing loss for the Blue Jays, who endured a 13-inning defeat when Ryan Tepera issued a four-pitch walk to Buster Posey. Incredibly, it’s only the second-most-demoralizing walkoff loss Toronto has suffered this season. On April 20, the Jays fell in 10 innings to Baltimore on a passed ball by catcher Josh Thole. Be the first to comment on "May 11 MLB Recap: What a Wild Day"